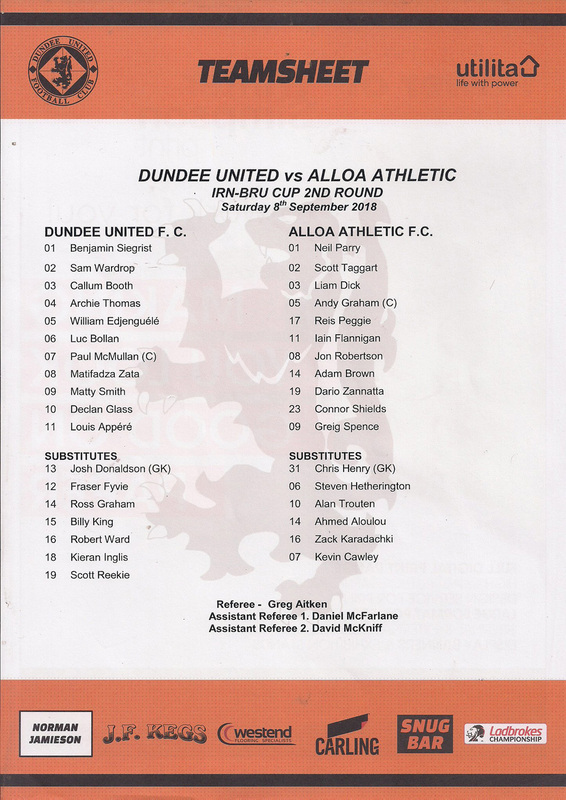 There was certainly more experience in the Dundee United starting line up than we saw in the previous round against St Johnstone’s under 21s. However, not one of the starters in this game saw any action in the previous week’s game against the same opposition, other than a brief cameo appearance in that game from Paul McMullan, who captained the side on this occasion. 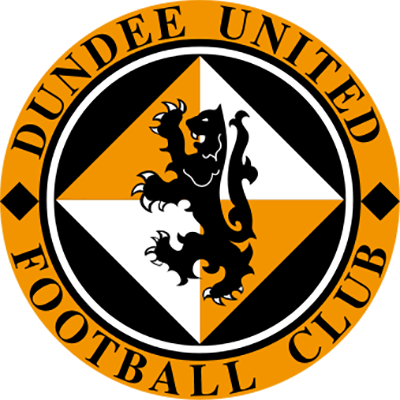 Of perhaps more interest to the United fans was the presence on the substitute’s bench of Billy King and Fraser Fyvie for the first time this season, with Fyvie coming back from the cruciate ligament injury he sustained in December 2017 which did so much to derail United’s season. 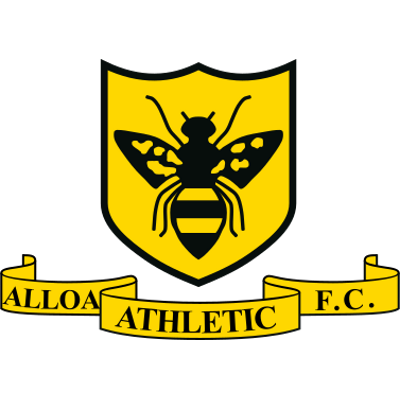 Alloa’s side was on more familiar lines although they did take the opportunity to make some changes to their team, with five changes being made from the team that started the previous week’s 1-1 draw. As in the previous round, reserve team manager Craig Easton took charge of the team. 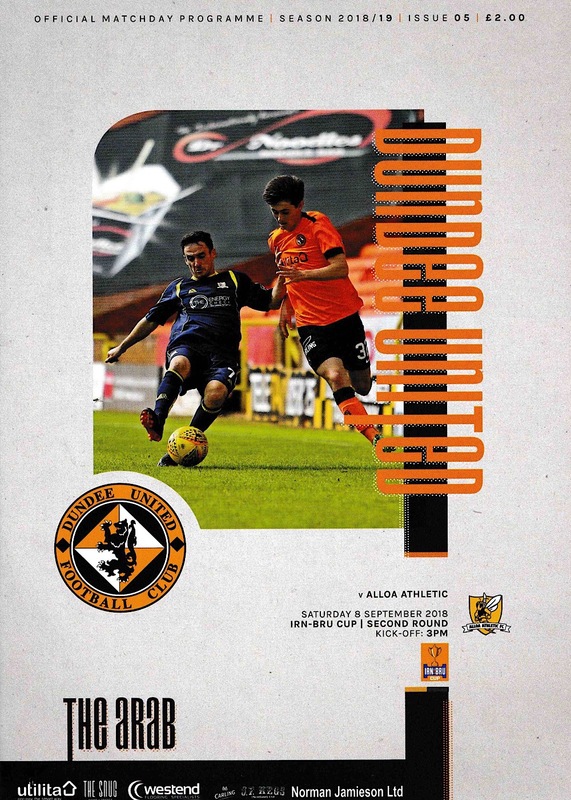 The first ten minutes were largely dominated by the visitors, and a spectacular overhead kick from Greig Spence which hit the side netting was their best early chance. However, the first clear-cut chance came for United when Paul McMullan flicked a volley just past Neil Parry’s left hand post after ten minutes. Then, after 15 minutes United grabbed the lead. Sam Wardrop broke down the right hand side and sent over a cross to the back post. Louis Appere knocked the ball down to Matty Smith eight yards from goal. He took one touch to control the ball before he drove the ball past Neil Parry in the Alloa goal for his first goal of the season. United began to control the game after scoring that goal, and probably should have added to their lead before half time. Just before the half hour mark Matty Smith nearly doubled his tally with a shot from outside the area after an impressive run from midfield, but he sent the ball just wide. Soon afterwards, Neil Parry saved brilliantly from a 25-yard Paul McMullan free kick, tipping the ball over the bar when a goal looked certain. There was a narrow escape for United as Ben Siegrist flapped at a cross and Greig Spence hooked the ball into the net. However, the Alloa player was deemed to have been in an offside position and the goal was disallowed. United made a change in defence at half time with Ross Graham coming on for Callum Booth. United continued to make most of the running and within the first couple of minutes of the half Mati Zata hit a drive which was comfortably saved by Neil Parry. The Alloa goalkeeper had been United’s nemesis in the previous games between the teams, and would be again as he pulled off a great double save soon afterwards. Parry firstly blocked a Paul McMullan cross at his near post, before then smothering a shot from outside the area from Archie Thomas. As the half drew on, two substitutions which would give great heart to the United support took place when Billy King and Fraser Fyvie were both brought on for their first appearances of the season. They came on for Louis Appere and Mati Zata respectively. United were to be punished yet again for only being able to eke out a one goal lead on the 78th minute. Again, they were to give away a penalty. Luc Bollan was the guilty party on this occasion, and referee Greg Aitken had no hesitation in pointing to the spot after he fouled Dario Zanatta. Alan Trouten had scored a penalty against United in the Betfred Cup game in July and he was to do so again, sending Ben Siegrist the wrong way from the spot. United did have a great chance to retake the lead two minutes later, however Paul McMullan took a heavy touch while trying to round Parry after being played through on goal by Archie Thomas and the chance was gone. Right at the end of the game, Fraser Fyvie had a go at goal with a free kick from 40 yards out. It proved to be on the ambitious side, and Neil Parry was able to save the ball easily to deny the United player a winning goal on his comeback. There was no further scoring, and meant that for the third time this season the teams played out a 1-1 draw. In addition, this was the second game between the teams to go to a penalty shoot out. Alloa had emerged victorious in the penalty competition in July in the Betfred Cup, and they were to prove victorious again this time. Fraser Fyvie and Scott Taggart were successful with the first two penalties, but Archie Thomas saw his spot kick saved by Neil Parry. Iain Flannigan, Declan Glass, Dario Zanatta, Paul McMullan, Alan Trouten and Matty Smith all scored from the spot, meaning that Andy Graham had the chance to win the tie for Alloa. It was a chance he was able to take, sending the ball past Ben Siegrist, a goal which sent the Wasps through to the next round.